Warner Bros. is making some plans towards the long-awaited Justice League feature film as Variety reports that Gangster Squad screenwriter Will Beall has been brought aboard to provide the screenplay. Details at this point are currently few, but the enormous success of Marvel's The Avengers no doubt helped pave the way for getting the Distinguished Competition's superhero ensemble a shot at the silver screen. What remains to be seen is whether or not Warner's film will use any of their standalone superhero projects as jumping off points, building a cohesive cinematic universe the way that Marvel has. It's been hinted that Christopher Nolan's upcoming The Dark Knight Rises will feature a definitive ending for the current version of the big screen Batman character, though Christian Bale has recently suggested that he's not entirely against the notion of further adventures in the cape and cowl. Next summer's Man of Steel, however, marks a more likely contender to launch an ongoing big screen universe and it's entirely possible that, despite a disappointing box office, last summer's take on Green Lantern couldn't be brought back. 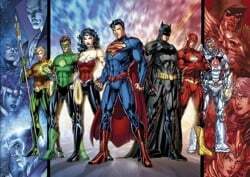 The other possibility is that Warner Bros. might start from scratch, as was the plan several years ago when George Miller was attached to direct a motion-capture Justice League feature.